In this week's So Many Fairies story, “Old Man Hickory,” Old Man Hickory Elf likes things orderly and efficient. This worked well when his hickory tree was part of a working farm. But that was long ago, and the farm is now gone and has been replaced by forest. The forest fairies and creatures struggle to follow Old Man Hickory Elf's rules and demands, as he is quite the task-master. But then one day, the playful antics of two young chipmunks turn things quite upside down. When people talk about hickory nuts, they usually mean the nuts from a “shagbark” hickory tree. The shagbark is so named because it really does have shaggy bark. One doesn't have to work hard to imagine one as an old man with a long beard and shaggy hair. Unfortunately, at least for those of us in the mid-latitudes and further South, one also doesn't have to work hard to imagine a persnickety, old tree elf guarding each hickory tree and rationing its nuts. That's because — due to their smaller nut meats and harder shells — shagbark hickories aren't as common once you leave New England and the East coast. In fact, their nuts are very difficult to find for sale. But, the good news — for our purposes today, at least — is that “hickory” is actually a genus of trees, not an individual species. 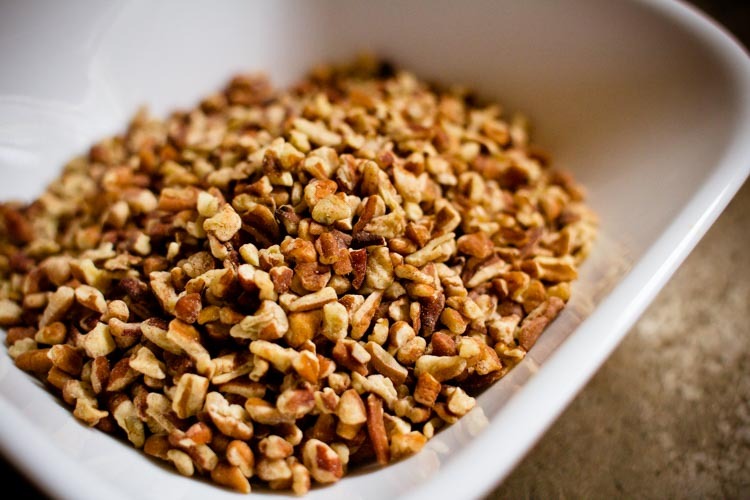 There are almost 20 different species of tree that can claim the “hickory” (or “carya” if you want the Latin term) designation, including the very common and easy-to-find-at-your-local-grocery-store pecan. Which is all to say that you will not have to fight a hundred year old tree elf to make these cookies. If you have access to shagbark hickory nuts, use them. If not, pecans will substitute just fine. You may have to fight a few (small human) chipmunks if you want to ration these cookies out slowly. But, as the elf in this week's story eventually learned, a little silliness (and maybe an extra cookie) is a joyful thing in the springtime. Pull the eggs and a stick of butter out of the fridge, then cut the butter in half. Leave half of the butter on the counter, with the eggs, to come to room temperature. Put the other half in a small skillet over low heat. 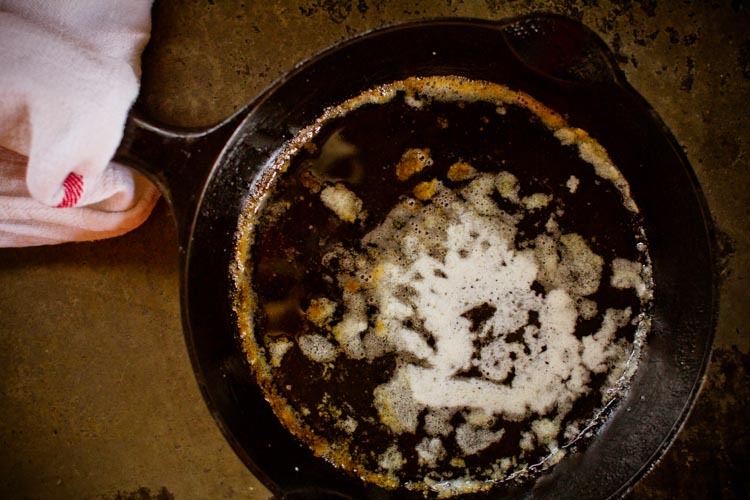 Brown the butter slowly, until the bubbles and spitting start to decrease and brown bits are floating on top. It should smell nutty and delicious. 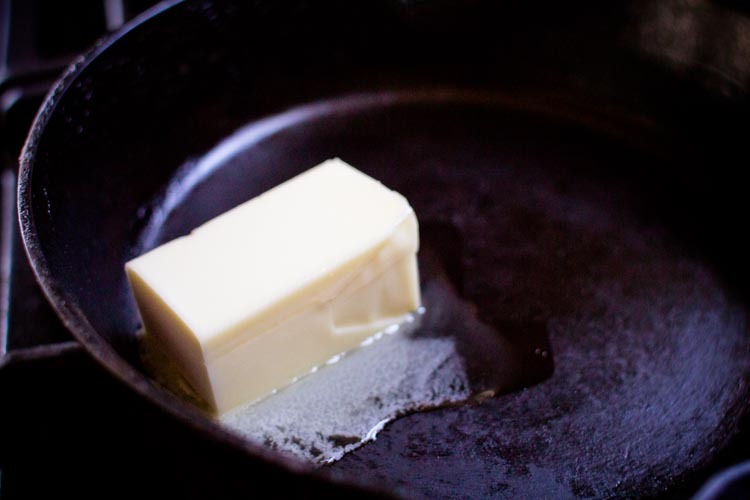 Once the butter is browned, turn off the heat and let it cool for 20 minutes. Set a timer to keep yourself honest, and do not rush this step. When the 20 minutes is up, begin preheating your oven to 350 degrees. 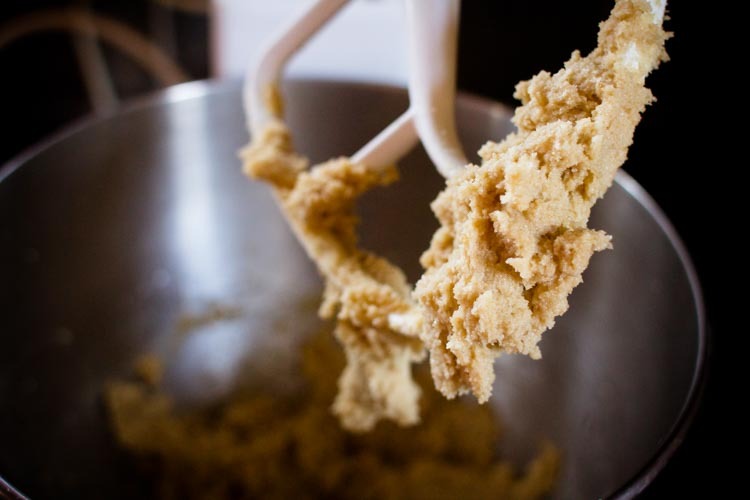 While the oven warms, cream the remaining, non-browned butter with the brown and white sugar. Everything should be well incorporated, but this mixture doesn't have enough butter to get truly light and fluffy — it will still be a bit crumbly. Once you've reached that stage, keep your mixer running and slowly drizzle in the browned butter, scrapping out the pan to get all the delicious browned bits. When that's well incorporated, add the vanilla and eggs, again, continuing to mix as you do. Then, sift together the salt, baking soda, cream of tartar, and flour. 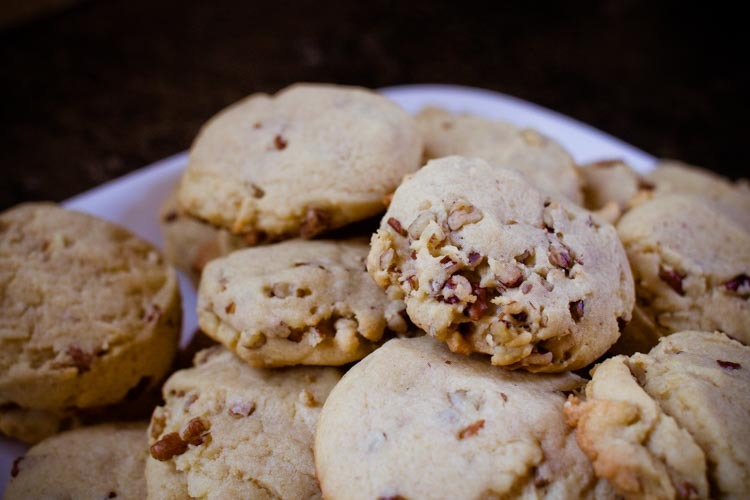 Add the flour mixture to the butter and sugar mixture a little at a time until it's well blended, then add the chopped pecans and give the batter one last, good, 15-second spin. Dollop the batter out by the spoonful onto a parchment covered bake sheet, and lightly press it with your hands to make a round. These cookies will only spread a little, so you can leave less space between them than is pictured here. 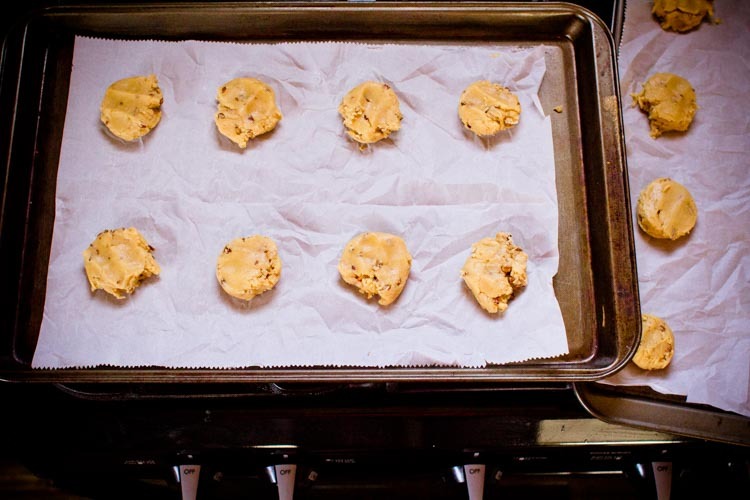 Bake the cookies for 10-13 minutes, or until the edges are just starting to turn golden. As with any shortbread cookie, don't wait for the tops to brown. 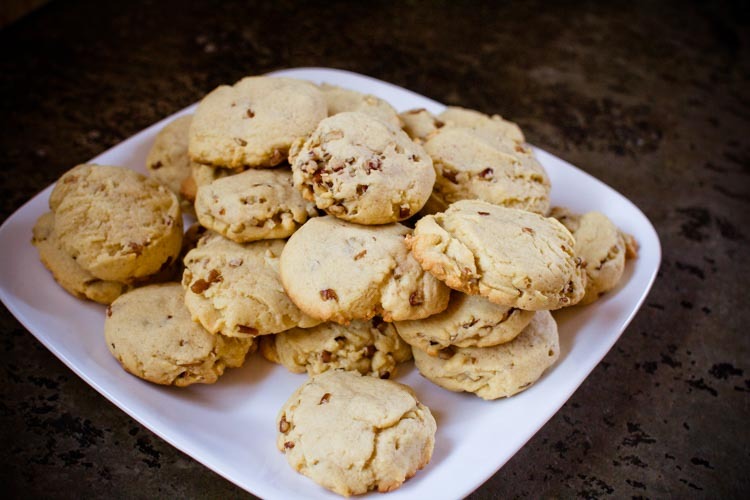 These cookies are best when allowed to cool and eaten with a warm mug of tea or a tall glass of milk.